U.S. Air Force pilots and maintainers stationed at Eglin Air Force Base in Florida are giving good feedback on the stability and performance of the Lockheed Martin-made F-35 fighter jet, Flightglobal reports. Col. Andrew Toth, commander of the 33rd Fighter Wing, told the website pilots are reporting few issues with aircraft hardware, software and engine once the F-35 is airborne. Sgt. 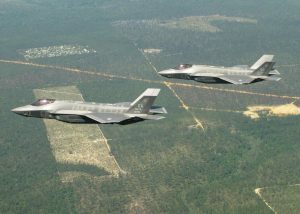 Skyler DeBoer, a senior maintainer with the 33rd Fighter Wing, told writer Dave Majumdar requests to fix problems are responded to within a few hours and process through the Joint Strike Fighter‘s autonomic logistics information system. Several of the F-35’s fasteners and access panels are not coated and Majumdar writes that reduces the workload for maintenance crews.